If you’ve been looking for the perfect florist to do your bridal floral decorations or wedding bouquet in the Mackay area, Starcut Flowers are here for you. Make your special day extra memorable with gorgeous, fresh flowers, artfully crafted arrangements and stress-free, friendly service. Have a look at our selection of wedding bouquets on offer. But florist selection of flowers due to different seasons. Using a combinations of just a few of these premium flowers like hyacinths, freesias, snap dragons , spray roses, stock and gorgeous premium roses. 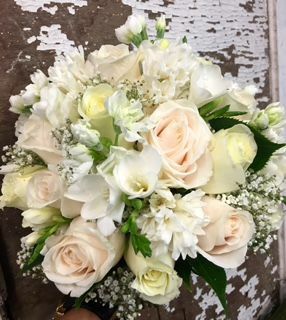 to finish this amazing bouquet off we would use filler flowers like baby's breath, Geraldton wax or thrip to go throughout the bouquet and tied off in your choice of Satin, Lace or organza ribbon. Smaller version of brides bouquet in Colour tones of brides choice but florist selection of flowers. Colour rose of brides choice of 30 stems of premium rose blooms finished off with your choice of green or silver foliage. Brides choice of stems bound with Satin, organza, Burlap or lace ribbon. smaller version of brides bouquet using 15 stems of premium roses finished off with your choice of green or silver foliage. Brides choice of stems bound with satin, organza, Burlap or lace ribbon. colours of brides choice but florist selection of flowers due to different seasons. 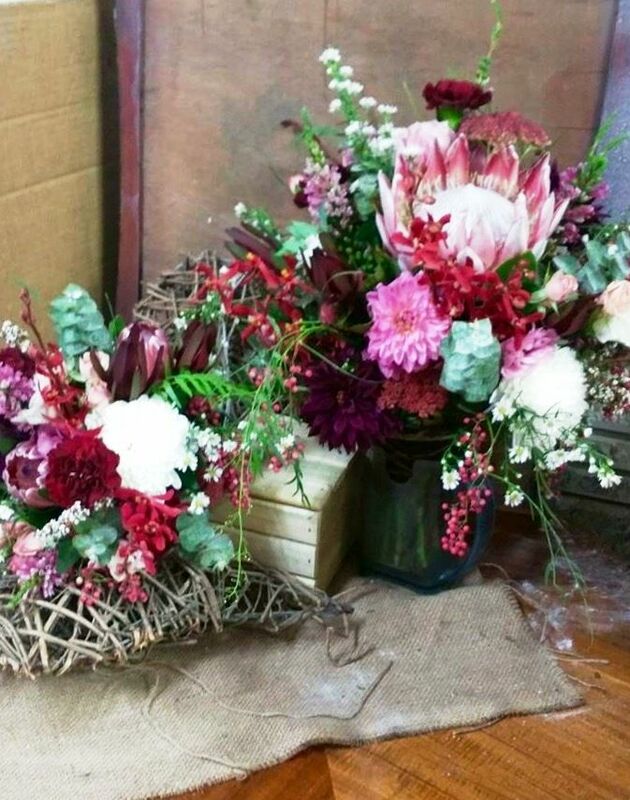 Using a combination of just a few of these stunning flowers like King proteas, pink ice proteas, spider orchids, disbud chrys , sim carnations, roses, lissianthus , Silvan reds with a lush selection throughout bouquet of spinning gum, Easter daisy, Geraldton wax, Erica and sacred bamboo trailing but all depending on flower season. Smaller version of brides bouquet in colours tones of bride's choice but florist selection of flowers. Brides trailing bouquet with Three options available. Option One : - Brides choice of colours and florist selection of flowers using Oriental lilies, dendrobium orchids and roses. Finished off with your choice of green or silver foliage. 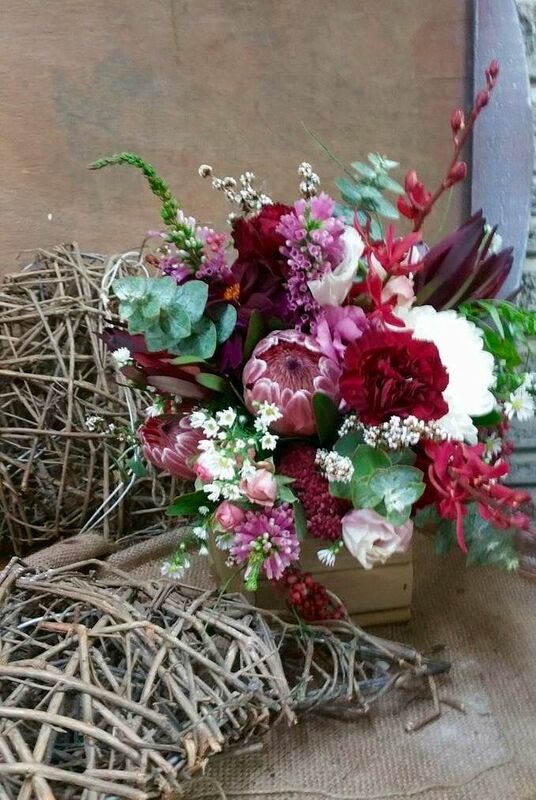 Natural stem posy style and our florist will match it to whichever option the bride has chosen in the colours of brides choice. Finished off with your choice of green or silver foliage and brides choice of colour using Satin, Lace or Organza ribbon for a stem wrap. Total $580 plus delivery fee on day of wedding is on top. Option two : - Rustic wrought iron arch decorated with foliage and flowers to match colours of wedding . For the ceremony spot where you would love to make a gorgeous tree the feature. Our stylist would decorate the tree with fabric to create the effect of an arch and hang a chandelier from the tree as well. We’re committed to making your wedding the most memorable experience it can be. 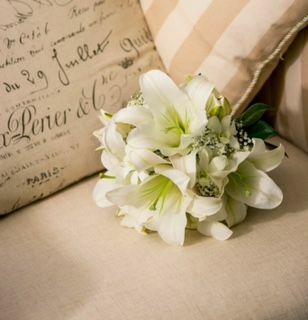 Get in touch with us at Starcut Flowers, and organise the flowers for your big day today!